Today's top stories, click on the headline to read more. CJS's pick of the countryside and wildlife news, updated weekdays. Sign up here to receive our daily briefing. We tweet many more headlines and scientific papers than we have space to include here or in our publications, please have a look at our twitter timeline to see all articles of interest. If you've followed a link from a story which is no longer on this page please try either the Week's News page, for items from this last week, or Archive for earlier articles. The Peak District National Park Authority, who manage 45 car parks and seven visitor centre and cycle hire facilities, say more than 50 tonnes of general waste and 10 tonnes of recyclable waste is collected by teams each year. The costs of dealing with litter and rubbish at National Park Authority-managed sites have now been estimated at almost £37,000 a year. National Park rangers say that simple measures such as visitors taking home what they bring into the National Park means that money can instead be spent on looking after the same locations where litter is the biggest problem. A Sheffield Hallam University graduate study undertaken in 2018, suggested that one in four items of plastic-based litter observed by visitors in the Peak District were single-use plastic bottles, with around one in five items being crisp or sweet wrappers, or plastic bags. Over 80% of visitors said they had seen plastic litter at some point during their visit. 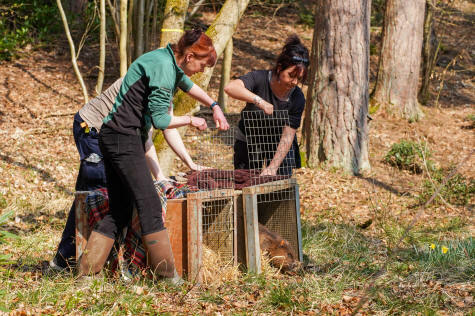 Forestry England has brought a pair of Eurasian beavers from Scotland to Cropton Forest in Yorkshire for a revolutionary trial in natural flood management. Spanning five years the trial will assess will the impact of the beavers’ activity on the long-term sustainability and maintenance of the “slowing the flow” artificial wooden dams. The dams have been helping to protect areas including nearby Pickering from flooding. This will be the first time in the United Kingdom that the effects beaver have on artificial dams has ever been studied. The pioneering project between Forestry England, Forest Research, Exeter University, and beaver experts Dr Roisin Campbell-Palmer and Derek Gow is building on the “Slowing the Flow” project, north of Pickering. Slowing the flow has been hailed as a big success and a potential model for other flood prone areas across the country. Forestry England expect that the beavers’ activity in Cropton Forest will improve biodiversity in their new 10-hectare home and may have the potential to reduce the impact of flooding locally. Monitoring will continue on site throughout the five-year project to assess these ecosystem benefits. Over 40 volunteers have been involved in the project so far doing baseline wildlife surveys, including birds, butterflies, bats, small mammals, otters, fungi, aquatic and terrestrial plants, fish, spiders and reptiles. The surveys will be repeated every year after release. A new approach to valuing the marine environment will be piloted in Orkney by the Scottish Wildlife Trust, in collaboration with Heriot Watt University, over the next two years. 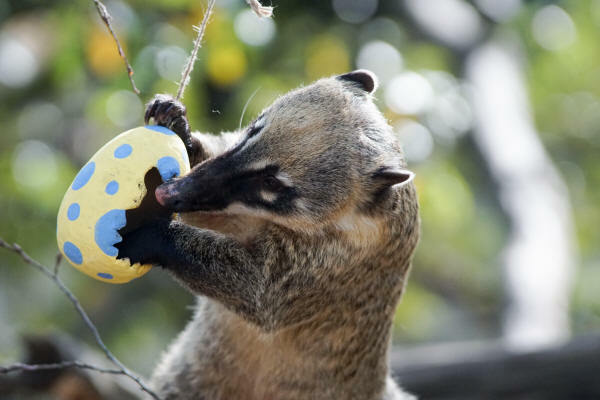 So we'll leave you with this lovely coati at London Zoo enjoying some Easter treats. CJS is not responsible for content of external sites. Details believed correct but given without prejudice. Disclaimer: the views expressed in these news pages do not necessarily reflect the views or policies of CJS.